Infamous recording studios to the stars. Description: Trident opened back in the late sixties and was the launch pad for many legendary artists such as David Bowie, Elton John, Queen and Marc Bolan. The names don't stop there. Trident was also booked by The Beatles (and later on Ringo Starr, George Harrison and Paul McCartney as solo artists/producers), Lou Reed, Carly Simon, Genesis, Supertramp, the list goes on. 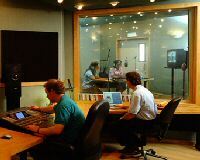 It was seen as a revolutionary place to record: with its laid back, talented engineers and inspirational atmosphere. It broke the mould and set both technical and professional standards for others to follow, including the then already famous Abbey Road Studios.